A teaching portfolio is a valuable tool for any teacher to showcase their accomplishments. You may have heard of an artist’s portfolio — or even a Shakespeare folio — but you might wonder what could be found in a teaching portfolio. This typically includes a variety of evidence that you’ve gathered throughout your career that backs up your teaching philosophy. Later in this article, I will flesh out this idea in greater detail; but for now, I’ll show you a few examples of good portfolios which I’m sure will help you make yours look awesome too. Dr. Paul Gordon Brown is an independent speaker and consultant, and has headlined conferences from Canada to Dubai on how education and technology intersect on various platforms. He is the Director of Curriculum, Training and Research at Roompact, a company that provides educational software solutions for residential facilities in higher education. Dr. Brown’s aim is to make life better for students who are getting used to living on campus. What I like. I like the way Dr. Brown approaches teaching as a privilege. He considers his role of consulting college instructors as a way to give back to the profession and reach many more students than he can personally train. Dr. Brown’s teaching philosophy is the first thing you see on his educator page, and you can tell that he’s passionate about it. He focuses on student learning and development to reach the whole person, and applies that philosophy to his teaching methods — in his own words, he constantly learns as he teaches. Gretchen C. Seibel is a third- and fourth-grade teacher who genuinely enjoys elementary school teaching. She focuses on language skills and is proficient in teaching Italian. She is also a post-graduate in English for Speakers of Other Languages. What I like. I like the home page with the photo of Gretchen in her classroom. The introduction is written in third person, which gives the impression of an endorsement. Showing good knowledge of website formatting, she doesn’t just have a wall of text, but gives introductory points about her skills and certifications, allowing visitors to read more if they’re interested. This is a good example of an elementary teacher’s portfolio. A professor at the University of Northern Colorado, Marc C. Santos’s main interests include research on rhetoric, ethics, critical and post-critical thinking, sophistry, new media, and gaming. Marc C. Santos believes that people learn through experience and reflection. He designs environments for students to have meaningful learning experiences, and has named this method postpedagogy. What I like. In this portfolio, the teacher showcases his ideas by posting a photograph that makes you think. He provides examples that show how interesting his methods are for students, because he wants learning to originate from the student, not the teacher. This portfolio is not in a format you might expect. It’s like a puzzle that draws you in. Ben Pettis is studying Communications at Colorado State University, focusing on Media and Visual Culture. He expresses his concern about the negative impact fake news, data collection, and targeted advertising may have on society, and conducts a critical examination of these issues. Ben makes it clear right from the start that he values open-mindedness in education. He clearly expresses his trepidation in his first college teaching job, and how much it taught him about the diversity of student goals and himself. What I like. Ben Pettis informs visitors to his website that it is a work in progress. He does clearly list his accomplishments, but this first-year teacher portfolio is more like a journal where we can see his thoughts and fears, as well as his development. It is engagingly written, and actually makes you want to visit again to see how he is doing. 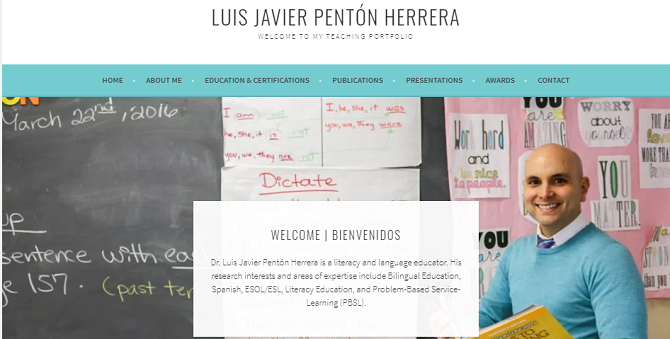 Luis Javier Penton Herrera is a high school teacher who holds two Adjunct Professor positions. He specializes in reading, language and literacy in English and bilingual education. He has given many talks as an advocate for teaching English as a second and third language. He served in the Marine Corps, and holds three Master’s Degrees. What I like. I like this website because it’s user friendly. The introduction is also in third person, creating the impression of an endorsement. The vibe is friendly and welcoming, and it makes the visitor want to look further into this teacher’s accomplishments. Gregory Tait has an academic background in philosophy and language, which is enhanced by his love of art, and music in particular. He is an accomplished musician who has appeared in several festivals and other venues, and his goal is to bring electronic music into the classroom through new media technology to enhance his students’ learning and self-expression. What I like. Gregory Tait has innovative views, and when you open his digital portfolio, you’ll see a short segment in which he talks about his views and supports his goals. Music is an essential part of his teaching method, so he needed a platform to showcase his talents. Any website where audio is important needs to be very user friendly. Cynthia Tobar is an archivist and community oral historian, and one of her main research interests is Communication of Memory in Archives, Libraries and Museums. She is a visiting assistant professor at Pratt Institute. She has participated in many exhibitions and performances in art and history, and fights for equal rights to higher education for lower-income families. What I like. Cynthia’s website has a clear, first-person narrative about her work and passions. It’s easy to navigate, and projects a warm, friendly atmosphere. She shows her personal interests, along with her professional achievements, which makes for a very attractive and interesting portfolio. Lisa Nelson is a Director of Digital Engagement and Professional Learning. She found school boring and wanted to do something to change it for others, so she became a public school educator. Lisa finds and shares innovative ways for students to get real-world experience and success. She is a major influencer in education, according to the Academy of Education, Arts and Sciences. What I like. Her portfolio blog is her main means of communicating her ideas. She has one of the top 15 Educational Leadership Blogs. The website is easy to navigate, and the hot topics are easy to see. Just one click will get you where you want to go. Lisa clearly states her passions in education, which include social media for students, being a connected educator, and learning with mobile devices. Ross McGill is the top influencer of education in the United Kingdom. He is the only classroom teacher to be featured as one of the top 500 Most Influential People in Britain. Ross has taught in some of the most challenging secondary schools in London. His Ph.D. from Cambridge University is on how social media influences educational policy. What I like. While the home page is all about Ross’s achievements — and they are impressive — the site also gives practical advice and help for teachers. From his 5-minute lesson plan to the free homework worksheets, as well as his paid services, @TeacherToolKit serves as Ross McGill’s teacher portfolio and online business providing educational material with the tagline Classroom Ideas, Teacher Training & School Resources. Larry Ferlazzo is a high school teacher who specializes in English and social studies. He has published many books on classroom management and parental participation. Larry is also a guest professor at the University of California at Davis. The author of nine books, he is currently working on a practical classroom book for science, social studies and math teachers. What I like. Larry Ferlazzo has a lot to offer educators, and his portfolio is more about helping teachers than about promoting himself. It’s not only about English language learners, but about every aspect of classroom management and teaching. Most portfolios are intended to introduce the teacher, but Larry needs no introduction. His articles, TV appearances and radio show are famous. The portfolio is always up to date with trending topics in education. Kelly Walsh is the CIO of The College of Westchester, and is on the Faculty of Administration. His passion, and the basis of his portfolio, is exploring the use of technology as an instructional tool and enabler for student success. He explains how technology can support student-centered learning and improve learning outcomes. What I like. EmergingEdTech is Kelly’s blog about using the latest technology in the classroom. It has a lot of good information, and offers those ideas to teachers. If you’re this established in the education field, you don’t need a portfolio to present yourself to potential employers. But take note: the tone is humble, and he expresses happiness at helping others while he continues to learn. He invites teachers and others to join his conversations on several social media platforms. José Louis Vilson is a Math for America Master Teacher in New York who is well-known in the education field. He has written articles for the New York Times and other top publications, and has served on The Board of Directors for the Center for Teaching Quality and other institutions. José is one of the GOOD Inc. 100 leaders changing their world. He is an activist and web designer. What I like. The home page starts with a photo of José working at his school. It gives the impression that he’s focused on his work and not posing for the portfolio. His accomplishments are presented on the home page with easy access to his articles, media appearances and speeches. This portfolio is straightforward and easy to navigate. Craig Kemp is an educator, originally from New Zealand, who is based in Singapore. He is the head of Digital Learning and Innovation at the Stamford American International School. Craig is a consultant for many other schools that are switching to digital learning. He is a co-founder of the award-winning Twitter chat #whatisschool. What I like. Craig’s portfolio home page is updated every day, and gives his colleagues access to a lot of chats and articles to help improve their teaching. The About page is written in the third person, so at least on the surface, it doesn’t seem like he’s touting his own accomplishments. This is a good model for teachers who are consultants, because it showcases his abilities and accomplishments while making his advice and help available to other institutions. Angela Watson is a National Board Certified Teacher who runs one of the top three educational podcasts in the world. Her aim is to support good teaching by giving her colleagues practical methods to reduce fatigue while increasing effectiveness. She designs resources to meet the everyday needs of teachers. What I like. Angela’s portfolio uses third-person throughout the website to showcase her accomplishments, which are many. It’s clear that her aim is to aid other teachers, and her website makes it easy to access the programs she offers. Angela’s tagline, “The Cornerstone for Teachers,” makes it clear she offers practical support and resources. An award-winning educational blogger, Vicki Davis aims to empower students and teachers to use technology to connect with the world. She is a Google-Certified teacher and speaks around the world on the use of technology in the classroom. Her Cool Cat blog is more than 12 years old and one of the Best Teacher Blogs for most of those years. What I like. Vicki’s bio is in the third person, but she comes in at the end to reach out personally to visitors, where she offers help and gives contact information. Her homepage is updated practically every second, so visitors will always find something new and relevant. The personal touch at the end includes a little information about her family life, children and pets. This is a very good touch for any teacher portfolio. The founder and director of the Learning Revolution Project, Steve Hargadon also chairs or co-chairs several pioneering world-wide virtual events for teachers. A firm believer that schooling should not get in the way of education, he provides information and inspiration at virtual and physical events to more than 550,000 members. What I like. Steve’s tagline is “The Learning Revolution Has Begun.” This immediately tells the visitor that what they will find in this portfolio will be innovative. The website also showcases other educators in a variety of fields, which is a good move, because it means visitors can regularly come back to get the latest updates in their field. Scott McLeod is an Associate Professor of Educational Leadership at the University Colorado Denver. He is a leader in school technology and speaks all over the country on innovative education. He has won many awards, and is a co-founder of Did You Know (Shift Happens) video series. What I like. This portfolio is provocative, inviting visitors to learn something new that may not be mainstream, but appears to be effective. The tagline says it all: “Technology, Leadership, and the Future of Schools.” Of all the examples on this list, this is the only one that provides direct contact, offering a portal for leaving Scott a voicemail. A teaching philosophy statement is essential to introduce yourself. How you view education defines your work ethic and motivation. It doesn’t need to be a thesis, but a short paragraph should summarize what you believe is the main purpose of education and the best methods for achieving it. A resume is important to tell visitors about your background, skills, and career objectives. It contains your education and job experience. Some of the resumes above are very impressive and some are simple, but all of them show dedication to teaching. A list or timeline of degrees/certificates/awards is sufficient to clearly show your achievements in each area to which you contribute. For example, you may have won an award for your podcast or as Best Middle School Science Teacher in your state. A few genuine examples of planning materials are essential. because they give a concrete sample to a future employer of your organizational skills and an overview of your subject knowledge. They may also be useful for other teachers. At least three letters of recommendation tell visitors to your website what others think about your work. If they are from prominent people, so much the better. You may get a letter of recommendation from a college professor, principal, colleague or a parent of one of your students. The contact page or contact information should be prominently placed and easy to find. Feedback from peers, parents, and students usually comes in the form of testimonials. The instructional technology page tells the visitor about your theory and practice of development and design, along with the management, utilization and evaluation of the resources and processes you use for teaching. The page on extracurricular activities speaks for itself; this is where you may add your golf score or passion for skiing. The blog page is where you express your ideas or write about something you have achieved that can help others. Create your own website using WiX, web.com, SITE 123, etc. Use your school’s or university’s website. Use a free platform such as Weebly, PortfolioGen or Edupholio. Free platforms may offer basic website features for free, but require you to pay for premium features. If you prefer, your portfolio doesn’t have to be posted online. It can be a PDF file that you send to prospective employers, or it can be a hard copy. One advantage of a PDF copy is that you can make sure it’s clean and error-free, and can’t be tampered with by an outside agent. A PDF document also retains formatting, so you can be sure the potential employer is seeing all your carefully chosen fonts and well-placed photographs or graphics. If your resume is being sent by an applicant tracking system (ATS), PDF may not be your best choice. If you prefer a hard copy, it needs to look professional with a hard cover, good graphics, and easy-to-read, well-formatted pages. Since there is no clickable menu in a hard copy, a table of contents is essential, so the employer can go to any section at a glance. This may include a cover letter, letters of recommendation, teaching philosophy, certificates, test scores, and your transcripts. If you are attending an interview in person, a hard copy has an advantage, because you can use it to support whatever information you give. See how to create a hard copy of your teaching portfolio. That’s it! I’ve given you all you need to create an informative and attractive portfolio. 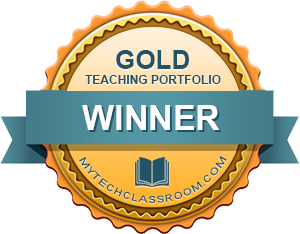 Each of these examples is a winner of the Gold Teaching Portfolio Award, even though some of them are vastly different from the others. Before you begin, you should decide how you want to present yourself, then make a list of all the important points that support who you are as an educator. Finally, select colors, fonts and graphics that are unique and easy on the eye. If you haven’t got a clue about design, ask for help from a friend or colleague who does. You can even get ideas online. Appearance is important. Creating a teacher portfolio is one of the few times in life you can wax eloquent about yourself for a good purpose. I am an elementary school teacher and the lucky mom of two little kids. I am passionate about creating lessons that both educate and inspire students. I believe in the power of modern technologies and try to find new and exciting ways to use them for teaching children.